As a color lavender has always been an interesting choice. It was noticed in several collections of well known designers such as fashion houses of Chloe, Dior, Jenny Packham, Nina Ricci ad Tadashi Shoji. If you like pastel tones and adore the shades of lavender, you should definitely consider adding some more bloom with a delicate lavender pearl ring or two. Your outfit will sing on a happier tune with such a pretty but statement accessory piece. In this article we will offer tips on how to dress up your wardrobe and accentuate your beauty with beautiful lavender pearl rings. An outfit of some denim skinny jeans and a white tank top can become sophisticated with a simple addition of a long pearl white necklace and a beautiful solitaire or cocktail lavender pearl ring. As a color lavender can be described as a light purple shade, mysterious and unusual, which can be light and deep, calm and bright. However, choosing the best combination to use the tones of this color to accentuate the look can be tricky. Deciding on the colors to make the entire outfit harmonious and accentuate your femininity and beauty take some time, patience and creativity. There are a few things to keep in mind while putting together an ensemble of lavender and purple shades, while combining them with contrasting colors, or some other palettes. Lavender has a few base tones- light, pale, amethyst, lavender and lilac. These shiny and light tones are perfect for pale completions, but go well with a shiny and nurtured skin no matter the color. Because of the shades of lavender hidden within the pearls there is a plethora of colors that you can combine them with, creating an interesting contrast. Pearl pink and lavender go great with ivy green, grape or plum purple, dark brown, beige and pastel shades of yellow and orange. Another option is to take the lavender as the base color and build the entire outfit around it. There are so many ways you can incorporate a significant ring into your outfit. Usually, pearl rings are commonly chosen and worn as engagement rings, graduation or anniversary gifts. Luckily, fashion trends and urban setters have pushed and liberated pearl jewelry from the shackles of classy (which is great, but can be dull at times). When it comes to choosing the perfect pearl ring, there is no right answer. Some latest trends combine the texture and color, and women wear one bulky multiple stone and pearl rings. They can come in many different designs and go great with a variety of colors and styles. In addition to that, the common solitaire single pearl rings, or a cocktail ring is the most common and rewarding when it comes to combining them with your outfits for various occasions. A quality freshwater pearl lavender ring can be a classy accessory for your jewelry collection. This freshwater cultured lavender pearl ring has a simple solitaire design. The pearl itself is a AAAA lavender freshwater pearl 9-10 mm wide. Its beautiful shade and perfect shape are enhanced with 14K white gold creating a light color and making it easy to combine your statement subtle ring with any pallet from your wardrobe. This truly high end ring will take your most casual and homy combination to an entirely new level. If you want to look sophisticated and mysterious in all occasions, while running errands, going to the office, or for any special occasions, and simple outings with friends, this ring will become that one thing your friends will always notice and start considering your special ring as a permanent statement piece that you will wear so gracefully! 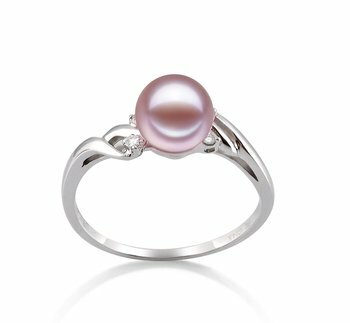 For you ladies that love somewhat smaller pearls and a more discrete choice of accessories, this elegant and simple Dana freshwater lavender pearl ring is the perfect choice. The .925 Silver Sterling accentuates the beautiful half twist design. The medium sized 6-7 mm wide pearls are subtly positioned between the peak of the half twist on each side of the ring, This well thought design elegantly accentuates the small discrete engravings that are aimed to mimic small diamonds. Another option is the majestic Clare lavender pearl ring. This particular design is a reflection of high fashion and has a circular patterned placement for the 6- mm wide lavender freshwater cultured pearl. The AAA shape button pearl reveals a different design, when combine with the highest quality 925 Sterling silver, it creates a champagne shade with the pearl. Even though it has a high-end fashion appeal, this beautiful ring can easily be worn with a semi-casual outfits, as well as more elegant business attire. The beauty of such rings is that they can last and are a true reflection of your unique character. If you like this design, but are a fan of sharper lines and a more contemporary look, the Jenna Lavander pearl ring is a perfect choice for you. It is slightly wider than the previous model, but will give the dazzle to your looks and will work with all coming fashion styles and trends. There are designs that are artistic and contemporary, but some ladies like their rings to represent the romantic and dreamy side, they may not have time or ways to express in the busy pace of their day-to-day lifestyle. These rings are the perfect choice for those women that love romance and hearts on their accessories. This freshwater cultured pearl ring in Jesicca Lavander is perfect for young ladies becoming women. The design can remind them of their doll houses and stories they made up while playing with their dolls. The two hearts can tell a story- they are the perfect gift for girls going to high school or university studies. The hearts will remind them of the parents and loved ones that are a part of their life and should have a special place in their heart always. The AA shape of the pearl is perfect for new pearl owners, that don’t have much experience with pearl jewelry, so they can learn, grow and cherish them on their journey to womanhood. A slightly more decorative and feminine design is the Andrea Lavander pearl ring. The medium sized pearl and feminine design make it a perfect fit for all occasions. The 14k White Gold band and sparkling accent diamonds laminate the pearl itself, and is a remarkable piece for your collection. Being on the high-end price range, it is a choice for women that know how to wear pearls and would definitely choose this design to become their statement piece and will wear them in the coming years. The glistening effect is enhanced by the high quality of white gold, matching almost any skin tone perfectly. Cocktail rings are jewelry pieces that are meant to accentuate your beauty and be a statement piece of your entire look, enhancing the overall impression with a minimal number of accessories. Such rings are often combined with discreet earrings or minimalist necklaces, as you always one to have a balanced look, and wearing several statement pieces at the same time can sometimes create the wrong impression. Don’t allow your jewelry to hog all the attention, but rather use it to accentuate your natural beauty. When it comes to cocktail rings with embellished natural pearls, the larger the pearl the better. Usually the pearl will be 9-10 mm wide and their natural glow will be enhanced with small diamonds or other gemstones of neutral colors, and ornament metal ring designs that provide secure and elegant placement of the pearl in the ring. We can present the Sadie lavender pearl ring modeas an advanced version of the previous ring. The silver ring frame décor reflect a more complex design and are fitting for young women that are growing and have some life experience. It is perfect for creative individuals that love to have that accent moment, revealing a floral and sensitive side, but still staying mysterious and playful. The freshwater pearl is larger, 9-10 mm in width and is definitely a statement piece that does not require much additional accessories. The design resembles the cocktail rings because of its large pearl as it is quite appealing and a perfect choice for cocktail dresses and classy business wear. The Fiona lavender pearl ring is the perfect example of cocktail rings The AAA pearl is nested in a beautiful floral design, and the freshwater lavender large pearl will definitely catch the eye of all spectators you pass by. Its design is perfect for formal and casual social events and requires very little effort to combine with your wardrobe and other accessories, as it is truly a story for itself. Wearing lavender pearl jewelry is a choice that will make you stand out of the crowd because of the beautiful shades of the natural pearls, and intricate designs of the rings made to enhance the beauty of single pearls. How do you like to wear your rings? Are you for the minimalists accessorizing, or do you love to play and combine different pieces on your hands? The most important thing is to enjoy wearing them and feel free to change styles and combinations to see what works best for you.